Who wrote Obama’s statement for Holocaust Remembrance Day? “We commit ourselves to keeping their memories alive not only in our thoughts, but through our actions,” Obama said in a written statement. I would not have put Dachau in the same sentence as Auschwitz, Treblinka and Sobibor. Dachau was not a death camp, although thousands “perished” there from typhus. The other three were death camps where Jews were gassed. Even Auschwitz doesn’t belong in the same list as Treblinka and Sobibor. Auschwitz was a large complex consisting of three separate camps; it was a transit camp and a labor camp, as well as a death camp. Since this sentence seems to be directed at “those who deny the Holocaust,” the author should have named Belzec instead of Dachau. Treblinka, Sobibor and Belzec were strictly extermination camps where Jews were gassed immediately upon arrival, while Dachau was mainly a camp for political prisoners. 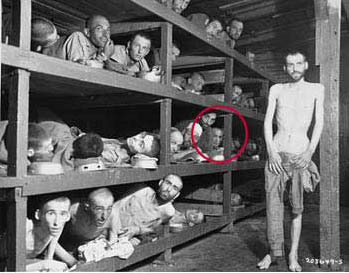 Charles T. Payne, who helped to liberate Ohrdruf, a sub-camp of Buchenwald, was Barak Obama’s great uncle, the brother of his maternal grandmother. Charles T. Payne was a member of Company K, 355th Infantry Regiment, 89th Infantry Division. According to an Associated Press story, published on June 4, 2009, Charles T. Payne’s unit arrived at the Ohrdruf camp on April 6, 1945. Ohrdruf was discovered by American soldiers on April 4, 1945. The camp had been abandoned on April 2nd. Dr. Deborah Lipstadt famously wrote in Denying the Holocaust that there is no “other side” when discussing the Holocaust. There is the official version, which is protected by law in at least 16 countries, and that’s it. Anyone who tries to present the “other side” is a criminal, as far as the Holocaustians are concerned. In view of this, President Obama should not have mentioned “those who deny the Holocaust.” It was a big mistake for him to acknowledge that there are people who believe in the “other side” of Holocaust history. Her statement puts heavy emphasis on Holocaust denial. Big mistake — in my humble opinion. She should have accentuated the positive, instead of bringing up the negative. Maybe a reference to the Nuremberg IMT, which provides irrefutable proof of the Holocaust, or some mention of the new discovery of mass graves at Treblinka, would have been better. The photo above is a copy of a page in the Majdanek Museum guidebook; it shows the official Thank You postcard provided by the Nazis for the prisoners to send in acknowledgment of the receipt of a package. 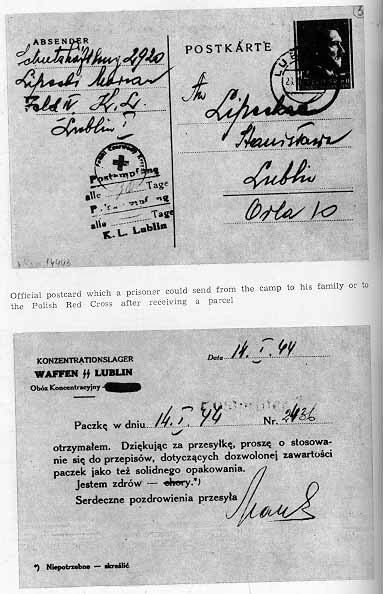 The text on the page reads: “Official postcard which a prisoner could send from the camp to his family or to the Polish Red Cross after receiving a parcel.” You can read about the Majdanek camp on my website here. I am indebted to one of the regular readers of this blog who gave me the idea for my blog post today. In a comment on my blog yesterday, this reader gave a link to a video which shows a postcard sent from Auschwitz-Birkenau. 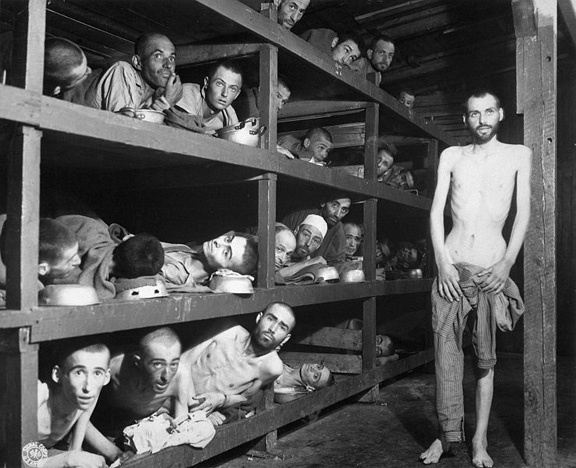 Young people today might be surprised to learn that, even in a death camp, the Nazis required the prisoners to have good manners. Yes, you read that right — the prisoners at all the Nazi camps were required to send a Thank You postcard to the Red Cross or to civilians who sent packages to the camps. The postcards were provided by the Nazis and mailed for the prisoners. Just because the prisoners were waiting to be gassed at Majdanek and Auschwitz-Birkenau doesn’t mean that they were exempt from the rules of society and could get by with scarfing down food sent by their friends and relatives without sending a Thank you card. When the Nazi War Criminals were put into camps, awaiting trial for their crimes, were they required to send a Thank You postcard to the Red Cross or the families who sent food? This is a trick question. The German war criminals were not allowed to receive Red Cross packages or food from civilians and they were not allowed to send letters or postcards. In honor of International Holocaust Remembrance Day on January 27th, I am posting some of the photos that I took in 1998 and in 2005 at Auschwitz, the main extermination camp of the Holocaust. Auschwitz was liberated on January 27th, 1945 by soldiers of the Soviet Union. I had a third-grade teacher who taught me to look up every word, that I didn’t know the meaning of, in the dictionary. So I went directly to an online dictionary and learned that “scuppering” can be used to mean destroy or ruin. I think a better word might be “demolish.” But have the arguments of the Holocaust deniers been “scuppered?” I don’t think so. 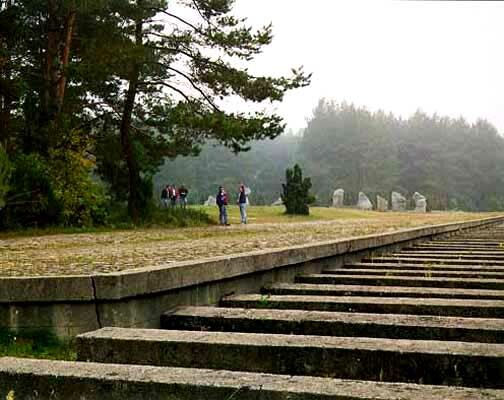 A lot of good comments about this subject have been posted on my previous blog about the “fresh evidence” at Treblinka here. Does this mean one-fifth of young “ethnic Germans” (Volksdeutsche) have never heard of Auschwitz, or does it mean one-fifth of all young citizens of Germany have never heard of Auschwitz? It is hard for me to believe that anyone in Germany has never heard of Auschwitz — unless they are recent immigrants from Africa or the Middle East. Did the people asking the survey question pronounce the word Auschwitz correctly? If the surveyers used the British or the American pronunciation of the word, the ethnic Germans might not have known what they were talking about. The Nazis built six extermination camps – Auschwitz, Chelmno, Belzec, Sobibor, Treblinka and Majdanek – all of them in occupied Poland.The murder of prisoners, most of them Jewish, began in 1941 when Nazi officials enacted Hitler’s ‘Final Solution of the Jewish Question’. The “Final Solution of the Jewish Question” was enacted in 1941? Does that mean “enacted into law?” NO, NO, NO! There was no German law in which the murder of the Jews was ordered. The murder of the Jews did, in fact, begin in 1941, but the Wannsee conference where the “Final Solution of the Jewish Question” was discussed did not begin until January 20, 1942. So the murder of the Jews was not ordered at the Wannsee conference. Auschwitz was not in occupied Poland when the camp was in operation, as stated in the Mail Online article. It was in the Greater German Reich. So was Chelmno. 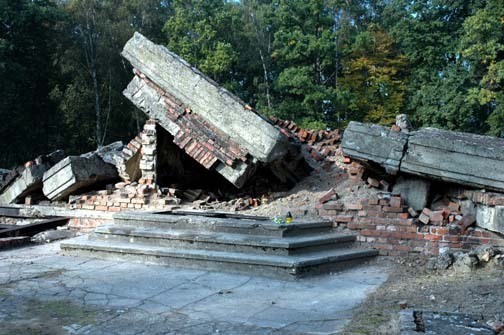 Chelmno was located in the Warthegau, a district in the part of Poland that had been annexed into the Greater German Reich after the joint conquest of Poland by Germany and the Soviet Union in 1939. The survey, published in Stern magazine, showed that of people over 30, 95 per cent had heard of Auschwitz and the crimes committed there. But less than 70 per cent could name the country it lies in. Auschwitz is in Silesia which was also annexed into the Greater German Reich in 1939. Silesia was given to Poland after World War I, in the Treaty of Versailles. After the conquest of Poland in 1939, Germany took back Silesia. Maybe 70 per cent of the Germans who were surveyed do not believe that Silesia should belong to Poland. Or maybe they were answering the question with the name of the country that Auschwitz was in when the camp was in operation. I’m guessing that the reason the survey found that one out of five young Germans had never heard of Auschwitz is because one out of five Germans are afraid to speak about the Holocaust, for fear that they will get a notice in the mail that they have to pay a fine for breaking the German law against Holocaust denial. It has been my experience, in visiting Germany many times, that Germans of all ages are afraid to speak about the Holocaust. I think that this survey might have been flawed by the survey takers not asking the questions in the right way. I have found that, when talking to German people, one must be very precise. For example, if you ask for a ticket to Frankfurt, you will hear “Which one?” Don’t go to Berlin unless you know how to pronounce the name of the city. If you want to go to Rothenburg, you must specify Rothenburg ob der Tauber. There are special places in Germany where Americans, who can’t pronounce Dachau correctly, can buy their tickets without being frowned upon for not knowing how to speak properly. A 1946 report by investigators into German crimes in Poland found “a cellar passage with the protruding remains of burnt posts, the foundations of the administration building and the old well” and here and there “the remains of burnt fence posts, pieces of barbed wire, and short sections of paved road”. They also discovered human remains as they dug into the ground, and on the surface “large quantities of ashes mixed with sand, among which are numerous human bones”. The section on Treblinka in the German Crimes in Poland. Volume I. Published by the Central Commission for Investigation of German Crimes in Poland. Warsaw, 1946 can be read in full here. 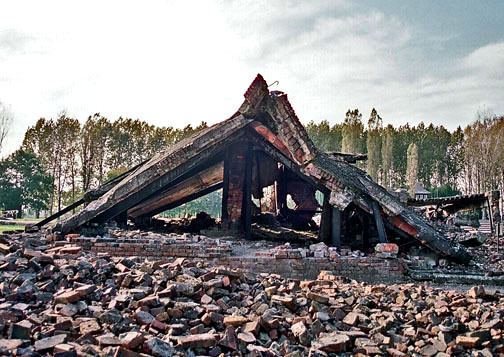 During the investigation when the ground was levelled, no collective graves were found, and this together with the evidence given by the witnesses leads to the conclusion that almost all the remains were burnt; the German authorities having had plenty of time to do it since the camp was closed. The site of the camp was ploughed over and sown, and on it Ukrainians were settled. They fled, however, on the approach of the Red Army. Now the mass graves, that the Polish Central Commission for Investigation of German Crimes in Poland was unable to find in 1945, have been found. And it was the BBC that reported it. The very first report of the gas chambers where Jews were being gassed was made by the BBC in 1942. The question of the alleged Arbeit Macht Frei sign at the Monowitz (Auschwitz III) camp came up in a recent comment on my blog. As proof that this sign taunted the prisoners in the Monowitz camp, as well as in other Nazi camps, we have the eye-witness account written by Primo Levi, who was a prisoner at Monowitz. I previously blogged about Primo Levi here, but I didn’t include the information that Levi mentioned the sign on page 22 of the book Survival in Auschwitz, the Nazi Assault on Humanity. The journey [to Monowitz from the Judenrampe] did not last more than twenty minutes. Then the lorry [truck] stopped and we saw a large door, and above it a sign, brightly illuminated (its memory still strikes me in my dreams): Arbeit Macht Frei, work gives freedom. We climb down, they make us enter an enormous empty room that is poorly heated. So the sign was on a DOOR, not a gate. It was the door to an enormous empty ROOM, not the door into a camp. Note that he not only saw the sign on the door, he also saw it in his dreams. It was still light when we passed through the gate and I saw the sign bearing the cruel promise ‘Arbeit Macht Frei’ — work sets you free. I didn’t know that the irony of those words would scream across the decades. 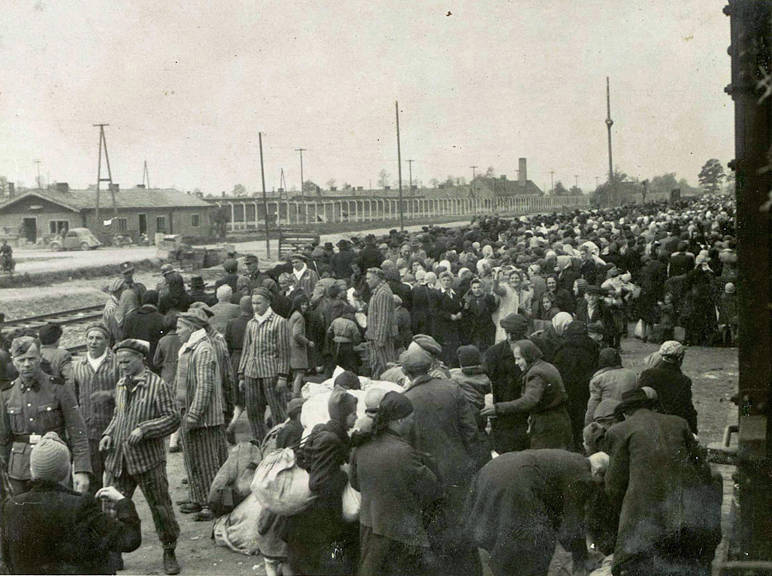 This was Auschwitz III–Monowitz. Note that the sign that Denis Avey saw was on a GATE, not a door. Rob Broomby co-wrote Denis Avey’s book. On page 235, we learn that Rob questioned whether this sign was actually on the Monowitz gate. As Rob’s research continued it threw up some interesting questions about the nature of memory. He kept asking me if I was certain I had seen that Arbeit Macht Frei sign at the gates to Auschwitz III–Monowitz. I was, but he said some experts had questioned it and nothing survives at the site today to testify one way or the other. The sign everyone knows these days is at the gates of the main camp, Auschwitz I. After more than sixty years it is that one which is emblazoned on the collective memory although many camps had them. Rob said the most influential account of life in the camp — that of survivor and writer Primo Levi — mentioned the sign at Auschwitz III more than once but the head of Research at Auschwitz wasn’t convinced. So was there an Arbeit macht Frei sign at Monowitz or not? I would say NOT. Primo Levi saw the sign in his dreams, and Denis Avey read about it in Primo Levi’s book. The Arbeit Macht Frei sign was used on the gates of the Nazi camps that were classified as Class I camps. Auschwitz I was a Class I camp and it had the sign. Monowitz was a labor camp which probably did not have the sign. I explained all this on a previous post which you can read here.